Separation always comes with fear. In a world held in place by human connection, we agonize over the slightest disjunction, worry about the possibility of it foreboding a more permanent estrangement. But in The Collapse of What Separates Us, it is not severance that terrifies, proposes a greater upheaval, but collusion. After all it is much easier to avoid, and infinitely more difficult to enter into entanglement with the other. The poet walks through the city, a flâneur, transcribes its attempts at coherence and the fragmentations that arise from them. He unweaves a tapestry of relationships and transforms them into words: wound, fog, market, shadow, café, mirror, static. Human experience translates into paper (“The face is the page on which the city writes”) through etymology, space, form and structure: line cuts mirror the obliqueness of lives, at times intersecting in angles, and at other times never adhering (again, or in the first place). And throughout all this, the city comes to define the person: “You have / lived in several cities, I have lived in only / one”, and persona and landscape merge into one. 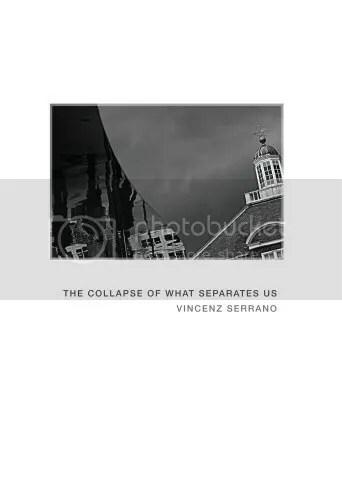 This entry was posted in Book, Poetry and tagged The Collapse of What Separates Us, Vincenz Serrano on January 1, 2011 by Michelle. Welcome to my blog. Here I attempt to re-view the world through film and literature. If you like my reviews, you can subscribe by clicking the button below. Comments are also appreciated.